Abused by human - 2 puppies. Sucie and Susan. (1)Sucie and Susan were rescued from LinKou. They were cruelly abused by a man. Sucie had lost an eye because of the cruelty, and Susan's leg was broken. Their poor brother wasn't so lucky, and he was beaten to death on the spot by this man. Even though Sucie and Susan were so cruelly treated, they are very friendly and love to be around people. They are both very sweet and playful. At 2 months old they have had a terrible start to life, although you would never guess it by their wagging tails at the sight of people. They now are staying at the center and are waiting for someone to give them the loving home that they deserve. Whoever is lucky enough to adopt these ladies will have the best gift life could give. Sucie和 Susan 因為被人為虐待, 以致於Sucie 一隻眼睛瞎掉,而 Susan則腳嚴重骨折. 更不幸的是, 他們的妹妹是被當場活活打死的. 她們倆現在在救援中心裡養傷, Susan的個性活潑, 精力充沛喜歡玩來玩去, Sucie較秀氣, 非常喜愛人類, 愛親親. 她們都愛被摸肚肚. 她們現在兩個月大,希望找到一個充滿了愛的家庭,給他們一輩子的幸福. DaTung was found on DaTung mountain. He had a large, serious wound on his neck, and he was missing a large piece of skin. He was also limping at the time of his rescue. Our vet has stitched up the wound on his neck and his leg seems to be recovering. DaTung is now at the holding center and is doing well. He's waiting for a loving family to take him home. 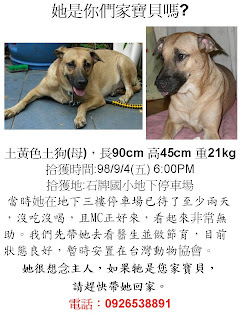 Sunny was found in a 2-meter deep water drain in BeiTou. He looked in pain and was constantly twitching. He was so scared that he tried to bite the person trying to rescue him. He was taken to a vet, but the vet unfortunately didn't want to touch him as he believed he had distemper. We then took him to a different vet and he was examined and diagnosed as having distemper. However, it is in its late stage, so it is no longer contractable by other dogs. He eats well and we will keep an eye on him. He is still twitching, but doesn't seem to be in pain, and therefore we will give him every chance to recover or live a comfortable life. Sunny是我們在北投一個2公尺深的水溝裡發現的狗狗, 當時他在水溝裡不停的抽搐,由於牠太害怕,當我們要抱牠出來時,牠試著想咬抱牠的人. 我們趕緊帶牠去一家獸醫院,但那個醫師一看牠的症狀,判斷極有可能是犬瘟, 就不敢碰牠, 開了藥請我們給牠吃. 我們趕緊再帶牠去另一間醫院, 經過詳細檢驗,醫師判斷牠是之前染了犬瘟,但現在已經過了犬瘟期. 不過由於病毒已侵襲到腦, 所以牠會不自主的抽搐,這樣的症狀會跟著牠. 目前牠住在中心裡接受觀察.